HSRC Press provided a limited input to the following report, which is favourably covered. The Impact of Open Licensing on the Early Reader Ecosystem examines how to use open licensing to promote quality learning resources for young children that are relevant and interesting. 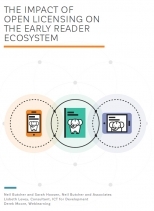 Research in early reading tends to focus on traditional publishing value and supply chains, without taking much consideration of new approaches and solutions emerging from the digitization of content and the impact of open licences. Production innovations considered include content creation models, storybook management and storage, and printing and distribution. all of which are evolving rapidly as new technologies are developed and applied. This paper also describes and assesses how major players in the early reader ecosystem impact on the production and utilization of quality resources. These include publishers, NGOs, libraries and literacy organizations, and donors. In addition, because cost models for open licensing any resource are different from commercial publishing, this report examines how open licensing and cost recovery can be effectively addressed in order to promote the long-term sustainability of local content creation, production, and utilization. Finally, this paper offers a detailed set of implications for early literacy content creation and utilization in low-income countries, which should underpin the development of creative ways to deliver books to young children. Also, the summary can be found at http://www.nba.co.za/impact-open-licensing-early-reader-ecosystem-report-summary. This is the URL for the full report: http://www.nba.co.za/sites/default/files/Early%20Literacy%20and%20Open%20Licensing.formatted.pdf.